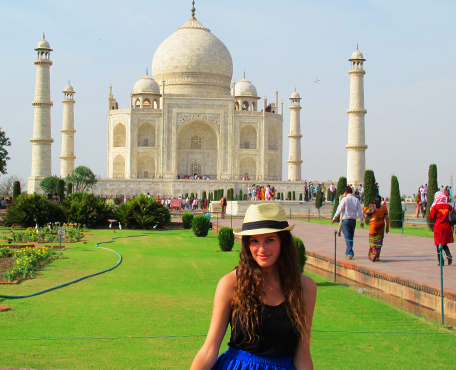 Agra one day tour is very convenient and comfortable and can be discovered in same day trip. Agra is very ancient city which is situated on right bank of Yamuna river. In the old time it was a capital of mughal, who gave a lot to this city like a world famous Tajmahal, Red fort, Itmad ud daulah, and many more which you are going to visit in this specific tour. We pick up you from hotel/home stay/airport/railways station, and drive to Agra by Express highway. After reaching the city you meet with our knowledgeable Guide who lead you entire tour and make to your trip memorable. First of all, we show you world famous iconic monument Tajmahal, which was built by Emperor Shahajahan in the memory of his beloved wife Mumtaj mahal rest of history you will know from Guide and 2 time approx 2 hour. After the Taj, we take you to Red fort, second historical monument. In which you can see so many palaces and imagine about their lavish life style, Time about 1:30 Minutes. Now the time for short break and during its you can have the lunch in well maintained a/c restaurant where you can enjoy the malty cuisine food. After lunch we show demonstration of inlay art so that you can have a idea that how Tajmahal would have been decorated with it. After having a lunch, we show you to 3rd monument, Itmad ud daulah ( Baby Taj), It is said that this building was a first example of Mosaic in India and some design was taken from here to the Tajmahal , it was built by Noorjahan who was the Mother of Shahajahan. We take you Mehtab bagh just back side of river, this place is called by name of sunset point too from where once again you can have a glance of Tajmahal then back to Delhi with sweet memory. We take you back to Delhi straight away and drop off you to your destination.